Every month SOIL’s program directors document key metrics which allow SOIL to monitor and evaluate progress towards our strategic goals. One of the dozens of performance indicators we keep a close eye on is the number of containers that are collected from EkoLakay toilets and then dumped at one of SOIL’s waste treatment facilities. Tracking containers is a way for SOIL to know how much waste is removed from the urban communities where our sanitation service operates, waste that would otherwise go on to contaminate water and spread disease. 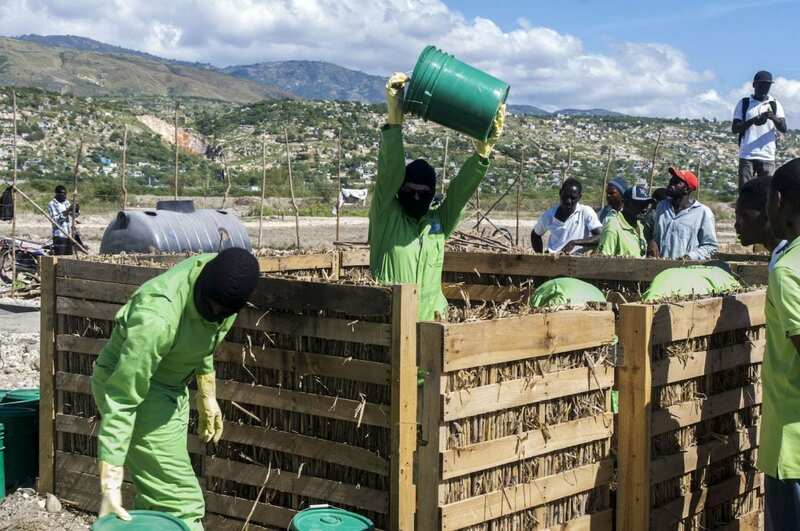 It also helps our teams anticipate how much compost we’ll have for sale once the waste has been fully treated and transformed (around six to nine months). We just wrapped up our fiscal year last month and are excited to report that even though SOIL spent the last year with an intentional focus on cost reduction and operational improvements to prepare us to more rapidly grow our service, we still increased the amount of waste we’ve treated by a significant amount. Over the last year, SOIL has collected and dumped 106,843 containers! That’s equivalent to an estimated 510 metric tons of waste. After the treatment process is complete, that will produce over 127 tons of organic compost that will make its way back to the earth to grow plants, stabilize soils, and sequester carbon. Here’s to transforming even more waste into environmental resources in the coming year! 1 Reply to "One Year and 100,000 Containers Later"
I was looking at the container doubleing rate at about 2 years. It does not seem to be getting shorter or longer by much. I hope well as a regular donater. The best Container Based Solution seems to be where some of the contents of the containers goes to growing black soldier fly pupae. These help offset the cost per month for the toilet, as the pupae are sold for fish bait and chicken feed. and not annerobically as happens in the compost process. The Container Based Solution, has a future in first world countries, as the traditional mail box changes to a more secure internet parcel storage unit. Eventually driverless parcel vehicles will service these new types of mail box, further reducing the per month cost of the future toilet service.